The Historical Journal continues to publish papers on all aspects of British, European, and world history since the fifteenth century. The best contemporary scholarship is represented. Contributions come from all parts of the world. The journal aims to publish some thirty-five articles and communications each year and to review recent historical literature, mainly in the form of historiographical reviews and review articles. 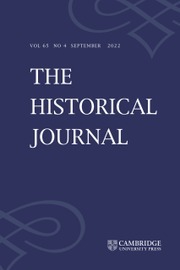 The journal provides a forum for early career scholars making a distinguished debut as well as publishing the work of historians of established reputation.